Tis the season… for apricots. These delicious, orange stone fruits are in season only until August, so now is the perfect time to enjoy the flavor and health benefits of fresh, organic apricots while you still can. Apricots originally hail from China, and the first apricot tree brought to the United States arrived in Virginia in 1720. Today, most of America’s apricots are grown in California. When they are in season, apricots are sweet and succulent, with a mild tartness. These fruits are rich in carotenoids, a type of phytochemical that gives apricots their bright orange color. One of these carotenoids is lycopene, which maintains the fluidity of cell membranes throughout the body, and has been linked to the prevention of a host of ailments, including stroke, osteoporosis, diabetes, infertility, cataracts and cancers. Apricots are high in vitamins A and C, and are also rich in beta carotene, fiber and potassium. Vitamin A is an antioxidant that is key for optimal vision. One study that surveyed over 50,000 registered nurses discovered that women who had the highest levels of vitamin A consumption had an approximately 40 percent lower risk of developing cataracts. Vitamin C is vital to the immune system, and may help the body fight diseases and infections more rapidly. It has even been linked by some research to the improvement of some cancers. Beta carotene has been found to lower ‘bad’ LDL cholesterol, and can support a healthy heart. 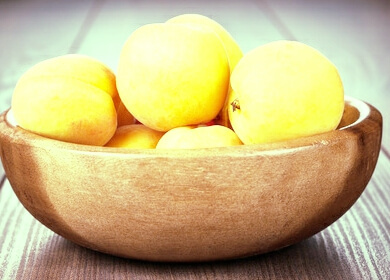 When eaten raw, apricots are a great source of fiber, which promotes a healthy digestive system. Potassium is an important mineral to the human body, as it helps keep pH levels balanced, builds muscle and keeps your heart functioning properly. Apricots also contain tryptophan, which can naturally help you get a better night’s sleep. Apricots are extremely versatile. They can be enjoyed on their own, sliced and added to salads, baked in savory chicken and meat dishes, or blended into your favorite summer smoothie. The choices are endless, and limited only by your imagination. It is important to choose organic apricots, to avoid exposure to dangerous pesticides which may be found in commercially-grown varieties. Non-organic dried apricots are often treated with sulfites, so organic is key when purchasing dried apricots, as well. If you buy these delectable fruits in season, however, you can always dry your own to enjoy year-round. Previous article500 Million Indians Eat this Spice Daily: Do You? Hey Buddy!, I found this information for you: "Lower Your Risk of Cataracts by 40% with Apricots". Here is the website link: https://www.thealternativedaily.com/lower-your-risk-of-cataracts-by-40-with-apricots/. Thank you.